Son of Henry Oran Randall and Julia Ann Sewell, Jones Marshall Randall was born on July 12, 1892, in Franklin County, Georgia. On April 4, 1909, Jones Marshall Randall (at age 16) married Mattie Lois Watson (age 23) in Franklin County, GA. The U.S. Federal Census records consistently indicate Mattie Lois Watson as being younger than her actual age. However, this was all rectified upon her death (see gravestone). She was indeed 6 years older than Jones Marshall Randall. Selma M Randall (Feb. 18, 1916 - 2004). Married Paul J. Shaver (born 1913) on March 5, 1934. Annie Lois Randall (Aug. 5, 1922 - 2002). Married Jasper Payne in 1954. Hubert Terrell Randall (Nov. 25, 1925 - July 20, 1995, in Durham, North Carolina, when he was 69 years old.). Married Helen Brown on Oct. 30, 1942. Source: “United States Census, 1910,” index and images, FamilySearch (https://familysearch.org/pal:/MM9.1.1/MLKY-QZV : accessed 24 January 2015), Jones M Randall, Shoal Creek, Hart, Georgia, United States; citing enumeration district (ED) 74, sheet 4A, family 71, NARA microfilm publication T624 (Washington, D.C.: National Archives and Records Administration, n.d.); FHL microfilm 1,374,202. 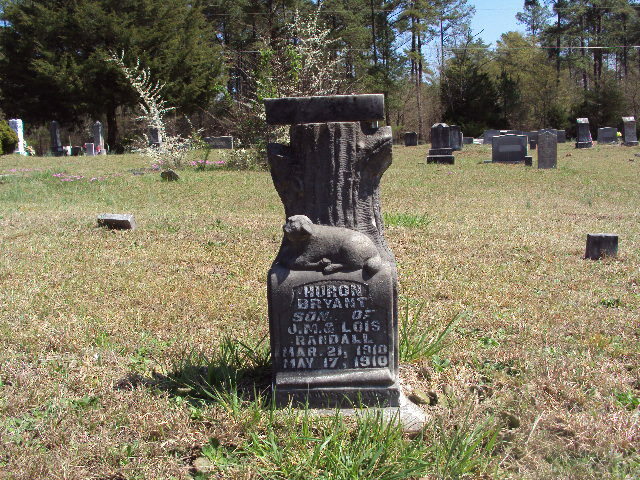 Tombstone for Huron Bryant Randall (Mar. 21, 1910 - May 17, 1910) He died in infancy.6). United States World War I Draft Registration Card, completed by Jones Marshall Randall, dated June 5, 1917. 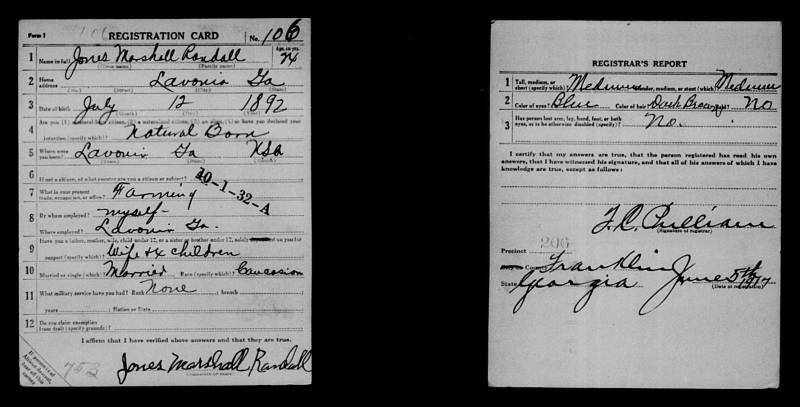 Source: “United States World War I Draft Registration Cards, 1917-1918,” index and images, FamilySearch (https://familysearch.org/pal:/MM9.1.1/KZZZ-YQN : accessed 24 January 2015), Jones Marshall Randall, 1917-1918; citing Franklin County, Georgia, United States, NARA microfilm publication M1509 (Washington D.C.: National Archives and Records Administration, n.d.); FHL microfilm 1,557,066. Source: “United States Census, 1920,” index and images, FamilySearch (https://familysearch.org/pal:/MM9.1.1/MJ64-K1D : accessed 27 January 2015), Jones M Randall, Hall, Hart, Georgia, United States; citing sheet 13A, family 239, NARA microfilm publication T625 (Washington D.C.: National Archives and Records Administration, n.d.); FHL microfilm 1,820,262. Source: “United States Census, 1930,” index and images, FamilySearch (https://familysearch.org/pal:/MM9.1.1/X33C-TZH : accessed 24 January 2015), Jones M Randall, High Point, Guilford, North Carolina, United States; citing enumeration district (ED) 0051, sheet 4B, family 71, line 54, NARA microfilm publication T626 (Washington D.C.: National Archives and Records Administration, 2002), roll 1695; FHL microfilm 2,341,429. His wife, Mattie Lois Watson, died less than a month later,on Nov. 11, 1974. They were buried beside each other at “Floral Garden Memorial Park”, High Point (Guilford County), North Carolina. 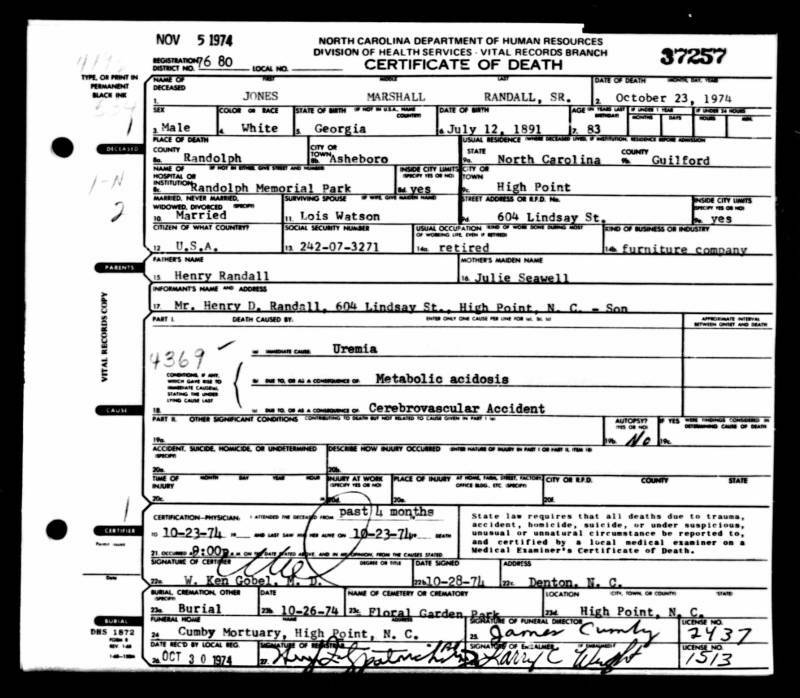 “North Carolina, Deaths, 1931-1994,” index, FamilySearch (https://familysearch.org/pal:/MM9.1.1/FP4Z-P81 : accessed 27 January 2015), Jones Marshall Randall, Sr., 23 Oct 1974; citing Asheboro, Randolph, North Carolina, v 37A cn 37257, State Department of Archives and History, Raleigh; FHL microfilm 1,983,958.